New firmware release 1.40 focuses on faster, better process documentation, including sample ID management and comprehensive performance-assurance reporting. This free, easy-to-download upgrade will help save time and improve results documentation. Testing with SmartCal, METTLER TOLEDO’s fast and easy tool to monitor moisture analyzer performance, has also been simplified and updated. Many products require batch-by-batch moisture testing to ensure consistent product quality. Now, the robust and easy-to-use HC103 halogen moisture analyzer from METTLER TOLEDO is making this type of routine moisture content determination more convenient to document than ever before with ID management, easier shortcut management, and simplified results reporting. Firmware version 1.40 now includes ID management. Sample and batch ID input can be performed simply, by connecting a USB barcode-reader directly to the HC103 and scanning IDs. A freely configurable strip print-out also speeds up and simplifies results documentation. These improvements help to eliminate the need for error-prone transcription, resulting in significant time- and resource-savings. Testing with SmartCal, METTLER TOLEDO’s fast and easy tool to monitor moisture analyzer performance, has also been simplified and updated. Now, users only see appropriate temperatures for a specific test to reduce error risk. These temperatures are then included in SmartCal results reporting for easier interpretation. Shortcut management has improved as well. Shortcuts are created from the main menu to enhance ease-of-use and allow the programming of several shortcuts at once. This saves time and keystrokes to enhance user comfort long-term. 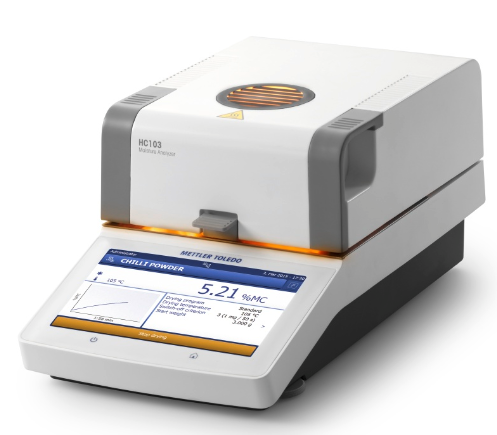 For labs looking to replace an HB43-S or HB43 moisture analyzer, a new HC103 is an excellent option to maintain reliability while streamlining processes. Firmware version 1.40 is automatically included with all HC103s manufactured since May 2017. Click here to download the free upgrade for existing owners or visit METTLER TOLEDO’s website for more information.